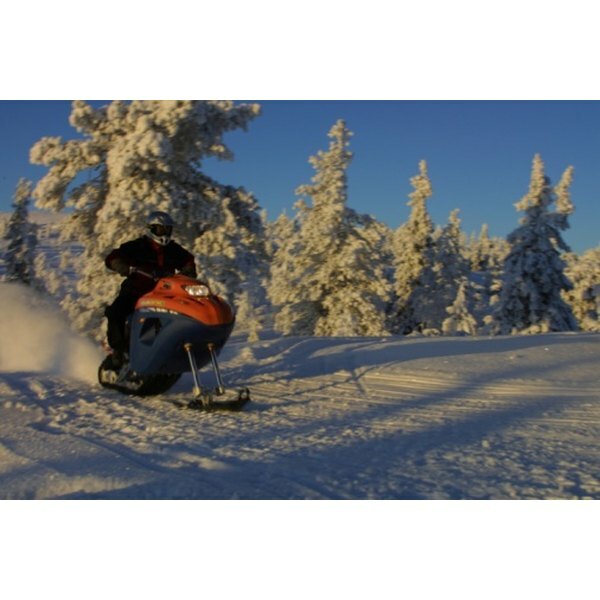 Celebrate a birthday with a snowmobile theme. For people who love spending winter days cruising through snow-covered woodland trails, a snowmobile theme seems like the ideal way to celebrate a birthday. There are many ways to carry out this theme and make details of the party convey a sense of wintertime fun. Capture the beauty of a winter landscape seen while snowmobiling by creating a winter wonderland inside with some snowy decorations. Use sparkly paper to create snowflakes, then hang them from the ceilings and windows. Create fake snow drifts by layering cotton batting on table tops and in corners of the room. White Christmas lights give the room a cheery flow and remind guests of snow. Finish the decor with posters of snowmobiles, toy snowmobiles and even a real machine outside. Transform a plain vanilla frosted cake into a wintertime treat that's perfect for a snowmobile-themed party. To create a snowy landscape, frost the birthday cake in a luscious layer of white frosting. Place miniature fake trees, available at craft shops, on top of the cake to add to the winter scene. Add a couple of snowmobiling figurines, purchased at a craft shop or a toy store, to integrate the party theme and add some fun. Let partygoers show off their creative skills by decorating their own paper snowmobiles. Draw an outline of a snowmobile, then let children color the page with markers and crayons, and adorn it in glitter, feathers and other craft supplies. If the weather permits, bring the party outside. After asking for parental permission, have an adult bring the children on brief snowmobile rides. Pick a scenic route that is also safe for children. Use a clip art image of a snowmobile to jazz up ordinary party favors into ones that show off the party theme. Tape a snowmobile picture to ordinary party blowers. With a little tape, store-bought party hats can also be more theme-friendly by adding a picture of a snowmobile. A tiny snowmobile toy can be fun for kids to play with.